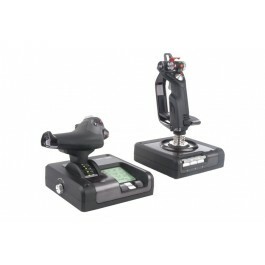 Saitek's X52 Pro Flight H.O.T.A.S. System is a fully integrated hands on stick and throttle flight controller that meets or exceeds the demands of the best flight simulator pilots. Featuring an upgraded multifunction LCD which shows in-game data in real time, a progressive throttle with tension adjustment, plus an adjustable joystick with a self-centering mechanism. The X52 Pro takes all the standout features from the original X52 and elevates them to a higher altitude..